I wasn't staying at a hotel on my first trip to Taipei. Rather, I was staying at a spare flat offered up by our host. It was his mother-in-law's flat, if I remember correctly. It was at one of those apartment buildings just near the city border; it sat beside a junk shop that had a mechanical arm doing all the sorting. We were at the eighth floor - but it was a two-floor apartment - so outside the window you could see an elementary school, and rows of apartment buildings, and a street that never gets busy. It was free accommodation, and despite the fact that we couldn't get the Internet connection to work, we were fine with it. (I commandeered the portable radio from the living room and took it to what was to be my room for a week . It was me, a futon, and a radio filled with Mandopop and English lessons, and I was set.) But that meant we had some difficulty getting around. Sometimes our hosts would pick us up and drive us to somewhere, but a few days later they taught us the quickest route to the nearest train station: we had to walk almost a kilometer to the Taipei Botanical Garden, and we had to walk through that - and a little bit more - before reaching one of the exits of the Xiaonanmen station. It was almost always empty. That made me feel like I've gone through more places when I set out to explore Taipei on my own. Really, I didn't; I was limited to what was near the train lines. But that's still more places than my companions, mostly a bunch of old people who, despite my every effort to tour them around, were more than content to sit at the Ikea food court for hours just mooching off the wifi. That, and the fact that we were somewhat off the grid train-wise. From Xiaonanmen I took a train to Ximen, which is a complete contrast, as that's one of the busiest stops in Taipei. It was a transfer station, too, to the blue line, which brings me to the places I want to go to: all those bookstores, all those department stores, all those little things that make me feel like I am indeed exploring on my own. Only I had a time limit, because the Taipei Botanical Gardens closed its gates at ten in the evening, and I'll have to walk longer, and maybe get lost, if I stay out any later. Twice in that one week, both on the blue line, while queuing for the train, I was approached by two different old women, who proceeded to ask me a question in Mandarin. Of course I don't speak Mandarin, nor any other form of Chinese, for that matter. Somehow, though, on the second instance I had an idea what the old lady was asking me. Something something something Shandong something. The next station was the Shandong Temple station. Was she asking me if she was on the right train? "No, no," I tell her, waving my hands. "I don't speak Chinese." Almost instantly someone behind me on the queue proceeded to entertain the woman, saving me from embarrassment... or, maybe, saving her. 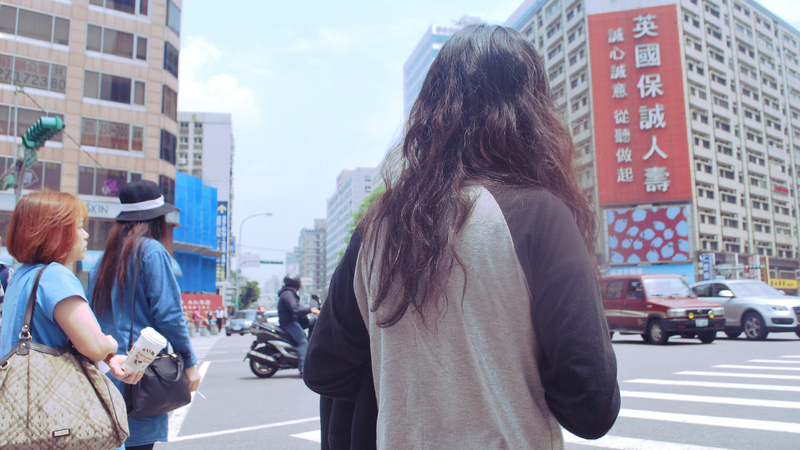 Jackie did tell me that most Taipei residents can speak some English, but are just too shy to start the conversation in that language. It's an easy assumption. I remember having lunch at the Muji restaurant at Xinyi and one of the staff asked me a question in Mandarin first. "Three-course set," I say, flashing three fingers. "One of this," - I point at one of the items on the counter, very much like we would in a carinderia, only Japanese and slightly Scandinavian - "one of this, and one of this." That, my snobbish self would concede, is the most broken my English could be. But we understood each other, and the guy at the counter - possibly early 20s, pimply, with eyeglasses - reminded me that, after eating, I should clean up after myself and put the tray at the tray station at the middle of the floor. Because I look - and am - new to this, of course. But the old women were a reminder that, everything else notwithstanding, my small eyes mean I look like one of them. That sounds reductive, but that very likely is it. I look like I know where I'm going, and I look like I am from the area, even if my wardrobe wasn't really jiving with what the rest of the city's youth were into. (If we're to follow Shalla's theory, we in the Philippines would embrace a trend around six months to a year after it first breaks out somewhere. Taiwan would take three months or so.) So, who else to ask? I've never really thought much of my eyes. I just know mine are different. My sister has big eyes; my brother's are typical. Mine, apparently, are small. As it turns out, when I was a newborn, someone thought I was a Japanese baby. As a child I was often described as "singkit". It was never derogatory to me; it just was that, so it was easy to accept, and soon it was so matter-of-fact nobody else pointed it out. However, I have been to Hong Kong, and I have been to Singapore, and nobody assumed I was Chinese, perhaps because the former sees me as clearly Filipino, and the latter sees me as someone doing business, complete with "did you study in the United States?" That first trip to Taipei offered an amusing reminder. Well, two of them. Well, three of them. The third was at busy Ximen. I had just gotten out of the train station when two American girls approached me and asked me a question in Chinese. Well, one of them asked, and her Chinese sounded impeccable, to what little of it - none of it - I know. "No, no," I said, again waving my hand. Turns out they wanted me to take a photo of them. They haven't seen each other in a while, it turns out; one was in Taipei to study, and the other, her sister, was visiting. I took their photo, chatted with them a bit, and promptly forgot to get their names for a then future essay. The fourth reminder came when I was in Seoul. It was our first full day in the Korean capital and we were going on your typical city tour. Our tour guide was this urbane, bespectacled young lady named Sunny, whose English was as smooth as the way her blue winter coat fit her. They couldn't leave because I wasn't there yet; I was getting banana milk, or some other snack, at the convenience store. I got to the outside of the hotel just in time, though. I'm still a bit of a stickler for time. Yet we milled around a bit more, because Sunny did not recognize me. Well, of course she wouldn't recognize me, but my folks knew I was there and said nothing, because, well, you know how family implicitly just know that everyone is there. "Are we still missing one more?" Sunny asked as she, for some reason, fiddled through Shalla's hair. "Me," I offered, raising my hand. "Oh, you're already here!" she said, a bit astonished. "I thought you were a regular Korean!" Again, small eyes, and perhaps the trench coat I bought for the occasion. That, coupled with my slightly-darker-than-most-Seoulites skin, meant I had what Shalla later called the "probinsyanong Koreano" look. I never thought it would happen, but then, all I knew about Koreans then are what I saw on the television: perfect porcelain skin, no matter who you are. I have a bumpy nose and I don't look chiseled, and yet it's a surprise this face can easily blend in Seoul's trains. The fifth reminder came just three weeks ago - at the Mactan Cebu International Airport. I happen to be following a Korean couple at the security check. One of the guards, a lady, looked at me and proceeded to give out the reminder she always gives every passenger. It dawned on me that she thinks I'm Korean, too. I don't know if I offended her. Maybe I did. Everything is offending these days, but I found my response funny. The sixth reminder was a couple of weeks ago. Shalla and her colleagues at work have this thing where they brave Binondo in the middle of Chinese New Year celebrations - as she would point out, no actual Chinese would be out celebrating on that day, choosing instead to keep their stores open and take the weekend off instead. It mostly involved jostling with the crowds along Ongpin, and then waiting ninety minutes for a table at Wai Ying, all in pursuit of those hot salad rolls, essentially fruit salad wrapped in rice paper, breaded, and deep fried. They say it's brilliant. It's... really just okay. While waiting, we spent some time at Diao Eng Chay. It was a place Shalla knew as a kid - as the daughter of a Taiwanese man, she was enveloped in Filipino-Chinese traditions, somewhat. It felt quite old school: just a counter with a lot of items on glass shelves, with the sound of Chinese-Fookien-accented Filipino and Filipino-accented Fookien occasionally bursting out of the staff, two of which are old (but relatively young-looking) Chinese women. Shalla was craving taro milk from her childhood, but unfortunately it wasn't there, so she shopped for tikoy instead. I took a bottle of gulaman out of the fridge, for I was thirsty and my bottled water had run out. Maybe she was being nice by calling me sioti. But, internally, I was like one of those memes that screams "mind blown". I have not heard that in a loooong time. That term, and others, was all around me when I was in college, from Friendster and Facebook posts from my friends and classmates of Chinese descent, of which there really are many. It's the sort of term you don't really hear if you're not from a Chinese family. And, suddenly, here I am, a sioti. "Sioti ka," Shalla giggled, as I pondered the fact that she has actual Chinese descent, only she doesn't look like it because she has relatively big eyes, and her late father was a native Taiwanese, and that will all make sense when you observe the older people in Taipei, and realize that they look different from what you'd stereotypically refer to as Chinese. "Siobe ka," I merely answered.